Lemon icebox pie sounds chilly, but January suits its sunny zest and pantry-friendly prep. 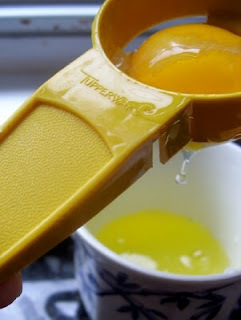 I recommend the Tupperware egg separator, should you spot one at the next yard sale. For ten cents, it really does release more of the white than your fingers or a slotted spoon. Meredith, this is my favorite pie. I love to make this pie. It was a favorite of my father's...I do not put the egg white topping on it though. (I save the extra egg whites and add them to the scrambled eggs the next morning) I make a crust of vanilla waffers. Recently I made this pie with chocolate graham crackers. Wonderful change. It was good...sweet, yet not too sweet.. I love that egg separator thing! Lemon anything sounds yummy! Question: I'm a little leery of uncooked eggs as I'm pregnant - do the egg yolks really cook through in the time it takes to brown the meringue? I just move the egg back and forth between the two eggshell halves as the white drains off. One is more likely to break the yolk that way than your egg separator, though. Meredith I make this pie all the time. In fact made it Sunday when Jamie and family came for dinner. Had Shrimp Scampi, salad and this for desert. 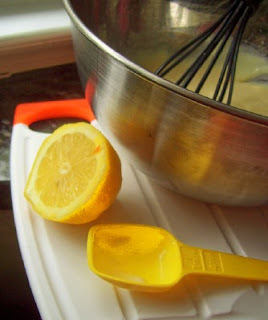 My differance - I use 3 egg yolks and bake for 350 degrees for 20 minutes. Pie is just set. Before filling pie crust I beat part of the egg whites and brush on the crust to make it crispy Bake it for 5 minutes at 375. Then fill with filling and bake. Cool totally and cover the pie with Kool Whip or whipped cream. Then refrigerate. Last for days in the frig. Of course I am by myself so it last longer. Have you seen the receipe for sweetened condensed milk on Down to Earth - I wonder if it is as good as the canned. Its a new one on me anyhow ! Sounds delicious! Makes us think of summer! Oh yeah.. and now looking for that egg separator thingy! Love it! I didn't know people used anything but the egg shells themselves. Hmmm. The egg separator is useful when you make a meringue and need to get every last drop of white without a bit of yolk. I'm not too good with the egg shells and seem to always prick the yolk in doing so. It is good! Lemon is my husbands favorite so this was a real treat when he came in from work. Thanks! Hi - where I come from we just call this Lemon Meringue Pie is that totally "foreign" to you all? I really don't think of this recipe as classic lemon meringue--although it *is* lemon and *does* have a meringue! Most lemon meringues I've seen have a cooked lemon filling that is more clear than custardy. This one gels when cooled in the refrigerator and does not cut into fine slices like the lemon meringue pies I"ve had in restaurants. I am a Tupperware Manager, and those egg seperators are given to people that have parties. You can only get them at the party. People LOVE them and are always asking me if I have one. Pretty funny!